FOXBOROUGH, Mass. (Nov. 23, 2018) – Eight years ago, the Kraft family and Patriots Foundation introduced Celebrate Volunteerism, a season-long initiative focused on recognizing community volunteers and promoting the importance of giving back to the community through service. Throughout the 2018 season, the foundation will continue its Celebrate Volunteerism initiative by teaming with nonprofit organizations to educate fans about the need for volunteering, highlighting deserving volunteers from across the region and seeking to inspire Patriots fans to become lifelong volunteers. The foundation will present a weekly “Patriots Difference Maker of the Week” award, which recognizes deserving volunteers who go above and beyond to support their New England communities. 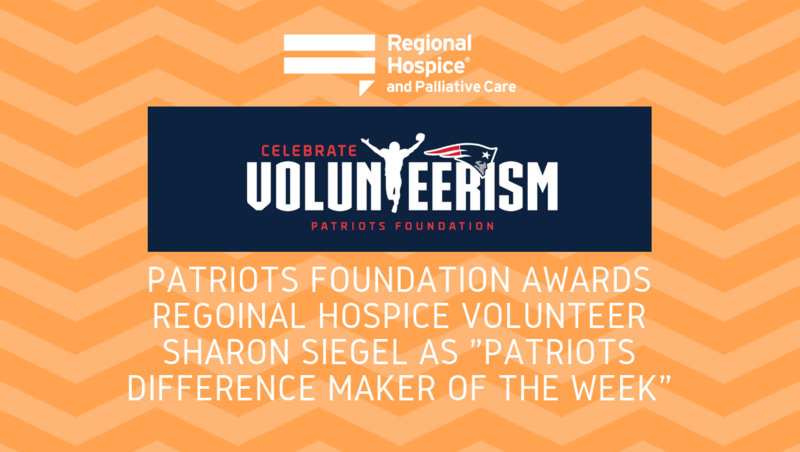 Sharon Siegel from Bethel, Conn. has been selected as a Patriots Difference Maker of the Week for her seventeen-year commitment to Regional Hospice and Palliative Care in Danbury, Connecticut. 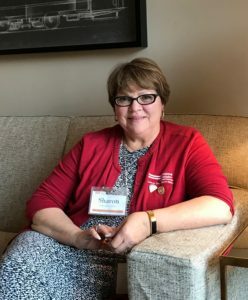 Sharon began her volunteer efforts back in 2001 as a support group facilitator in the nonprofit’s Healing Hearts program, a children’s bereavement program. Several months after joining, the September 11th tragedy at the World Trade Center affected many families in the western Connecticut area. Sharon stepped up and co-facilitated a support group to help children and families who lost someone in the attack. Six years ago, following the tragedy at Sandy Hook, Sharon was called upon to support families from the school. She offered a critical service to children who lost a sibling in the shooting and continues to offer grief and bereavement support to the families. Sharon’s trademark contribution to the Healing Hearts program was the invention of the “Comfort Pillowcase.” She invited the children to bring in a piece of clothing that belonged to their loved one, who passed away. Sharon sewed the clothing into the pillowcase, in the shape of a heart. As the grieving families lay their heads down to sleep, this special pillow case provides immeasurable comfort and healing. “To be honored for something that I love doing is just incredible,” said Sharon. In addition to her volunteer efforts with the children’s bereavement program, Sharon is a family support volunteer for the agency’s hospice program. She works with adult and pediatric hospice patients and their families at their homes and at the in-patient hospice center. Sharon has taken on a leadership role, serving as a teacher and mentor to new volunteers. She considers her volunteer role to be an honor, often emphasizing that she is part of a team and a family. Fifteen individuals will be named Patriots Difference Makers throughout the season. The outstanding volunteers will be recognized on the Patriots website and in print materials, including Patriots Football Weekly and Patriots GameDay magazine. They will also be honored during a special ceremony at the Patriots final regular season home game against the New York Jets on Sunday, December 30. Fans are encouraged to nominate a local volunteer for the Patriots Difference Maker of the Week award by visiting www.patriots.com/community.